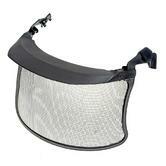 The 3M™ Stainless Steel Mesh Visor V4C made from Stainless Steel with a black matt finish. Excellent stability, even after long use. Low light reduction, thanks to the rectangular grid providing excellent protection from flying chips and splinters. 3M Mesh Visors V4C are designed to fit Peltor™ Safety Helmets. All mesh visors are tested and approved under the European Standard EN 371 and meet the requirements for increased robustness (S marking). Mesh Size: Ø0.24 1.8 x 2.5mm.